Reading break at Portland! Friends, dining, shopping- the perfect trio! Reading break has officially started! But it felt like it had begun two days ago! My friends and I went on a road trip to Oregon basically right after school ended on Friday. It was a tough ride since the drive took at least 5 hours to get there, but it was worth it! Poor William (our friend who drove)! He had to pick up the car AND drive us there! But, we had a shotgun system where we rotated people who sat in shotgun so that they can keep Will company– even if everyone else was sleeping. What kind of sucked was that I was a bit sick during the trip. Through my lack of sleep and unhealthy lifestyle choices during midterm exam weeks, I managed to get sick. Joy oh joy. My voice is currently gone from all the talking I tried to do with my sore throat during the trip! We stopped by a McDonalds’ on the way, just like we did last time. Connie, Will and I headed over to Hagens to look for fruits or veggies to munch on…sadly we were sidetracked by the bulk section of the store. SO. MUCH. STUFF. Connie bought us all chocolate covered gummy bears, chocolate covered coffee beans and chocolate covered almonds!! Yum 🙂 Afterwards, we went back on the road and continued our drive. 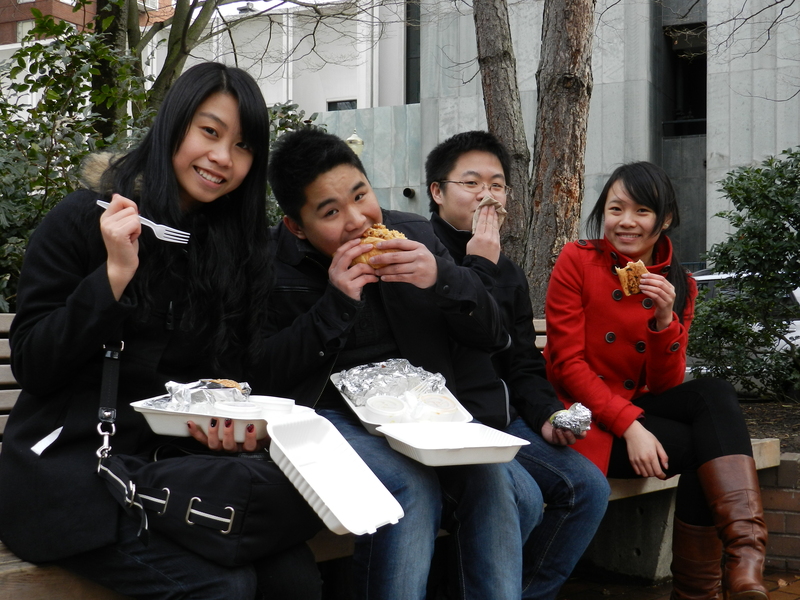 Us and our street food! At night, we drove by a McDonalds’ to steal their free wi-fi so we could search up good eating joints around town. 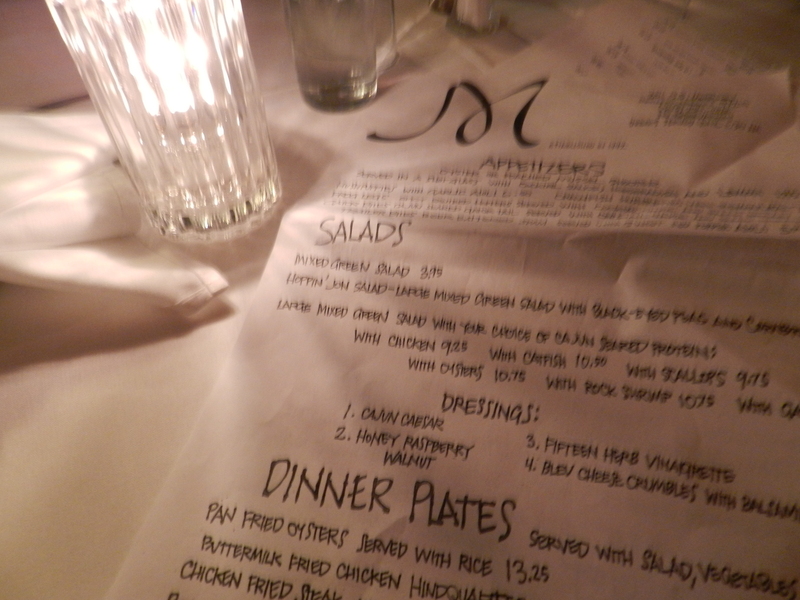 We finally settled on Le Bistro Montage, which had high ratings from everyone online. We arrived at the restaurant and we thought it looked very sketchy. It was kind of under a bridge, where it was really dark and creepy. It was around the industrial part of town and there was no other restaurants nearby…just the one. BUT, when we arrived, we put down our names for a table and was told that the wait would be one and a half hours! That made us curious as to what restaurant would require that long a wait! The actual wait took around two hours, and by then, we were ready to eat whatever was thrown at us. The place had a nice vibe to it, though it was really dark. There were huge paintings decorating the walls, as well as little trinkets such as a skull of some sort of animal, and a dried puffer fish– things of the like. We all sat down and was ready to order within minutes. I got the buttermilk chicken with garlic mashed potatoes! 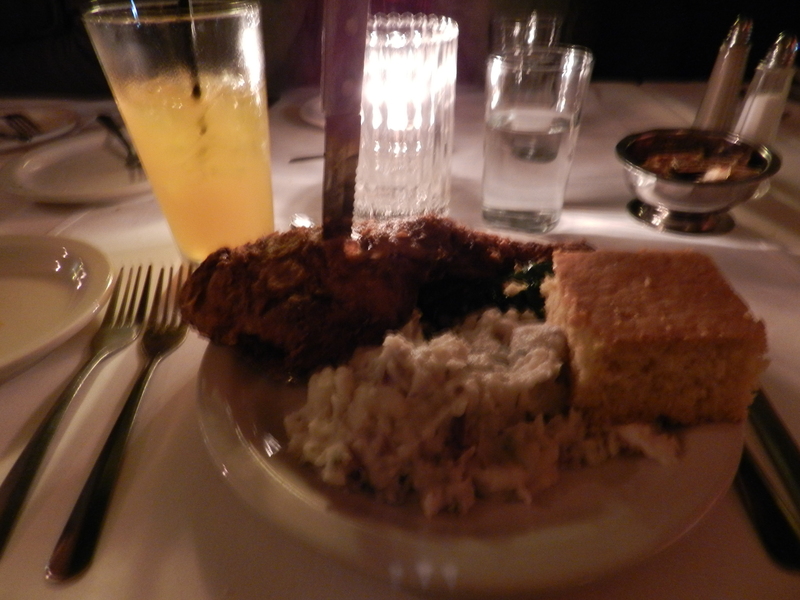 It was served with veggies and corn bread! Delish! I also ordered a POG juice, which was as combination of passionfruit, orange and guava juice! I am so glad I tried it because I loved it! Wish they had it in Canada..or do they already have it?? Will do some juice hunting. 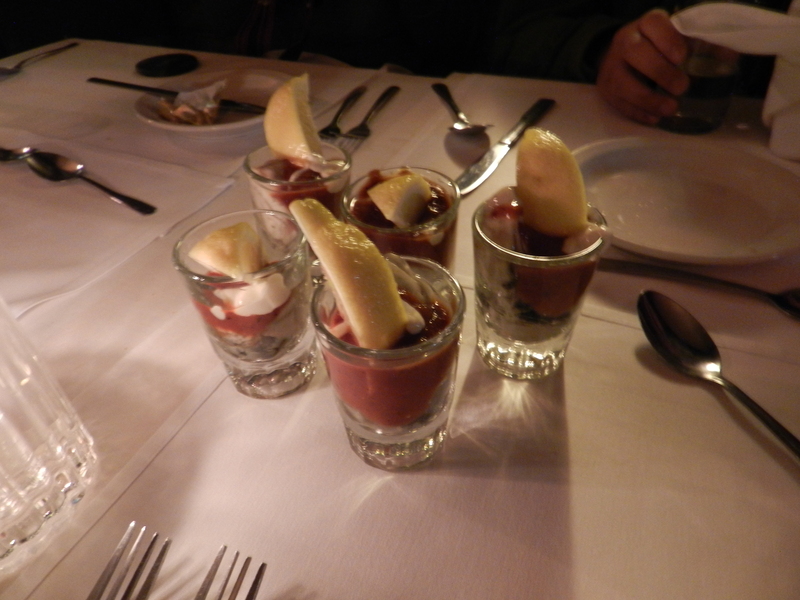 Some of us also ordered oyster shooters, which were so delicious I went and ordered another one. Overall, the place was pretty awesome asides from the wait. I would definitely recommend it as it was not an expensive meal, and it provided a unique dining experience. 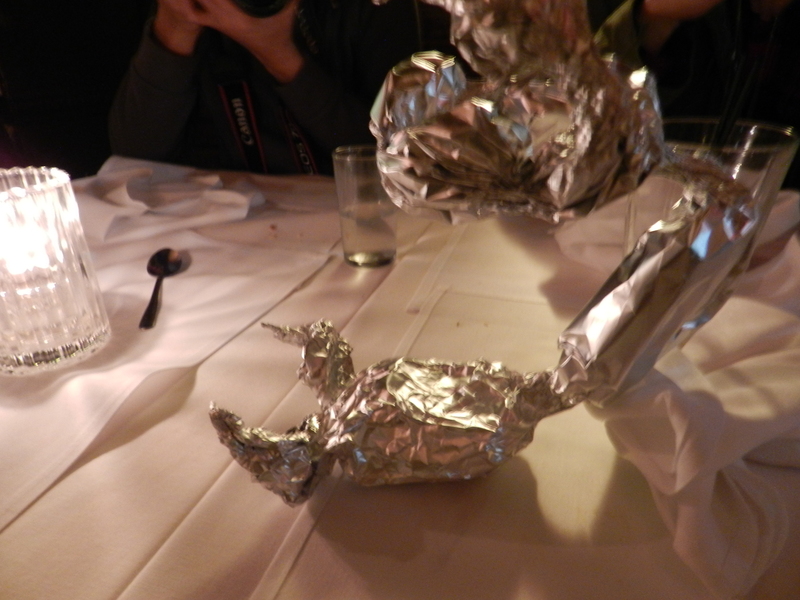 Oh, and if you have food left, definitely ask them to help you wrap it up! They do the funkiest foil art for you! Connie took some of her Jambalaya to go and they came back with a scorpion-shaped package! Buttermilk friend chicken and garlic mashed potatoes! 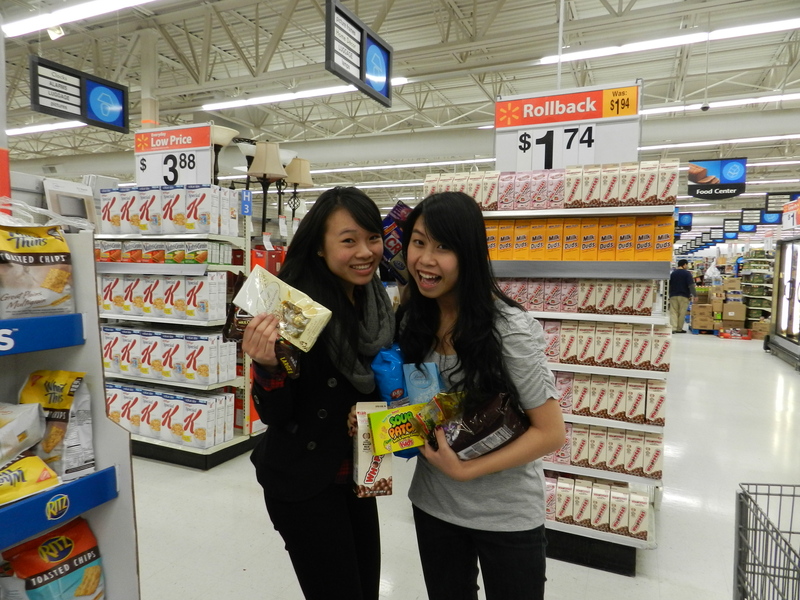 Later at night we visited a Wal-Mart, where Connie and I freaked out about how big everything was! Big bags of candy? Hell yes! We all started grocery shopping and returned to our motel well after midnight. One thing I dislike about Portland? How far everything is from each other! I cannot imagine what it would be like to commute around that city…honestly, I am pretty sure everyone has to drive. Being from Vancouver, everything is pretty well connected, so it was hard to have to cross a million bridges to get to a certain part of town. After spending a good chunk of time playing “The Game of Life” (we lost miserably. We as in Connie, Monica and I), we then returned to our respective rooms for a good nights sleep. Which was not that good because I woke up freezing since apparently we forgot to turn up the heat. We are so smart. The next day consisted of a LOT of shopping. We tried to make use of Portland’s tax-free system, and then we headed over to Westfield Southcenter Mall for lunch at Jollibee. I was kind of excited because back in Hong Kong, so many of my friends at Jollibee! It was my first time eating a meal at Jollibee and I thought it was delicious! Sure it was kind of greasy and unhealthy, but delicious all the same! 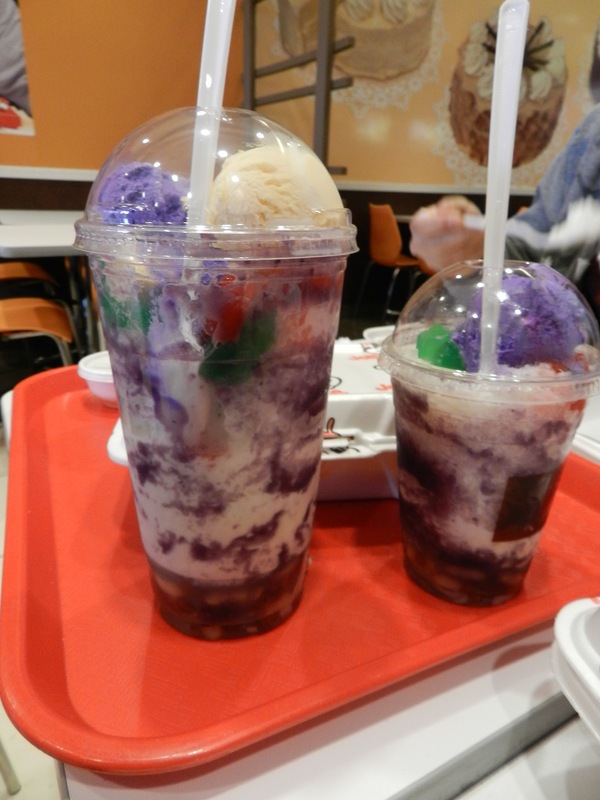 Us girls also split a halo halo, a popular Filipino dessert! It was also my first time trying that and it was DELICIOUS! If I was not getting so cold from the drink, I would of had more! Again, I am skipping the details of our shopping expeditions and moving on to dinner. 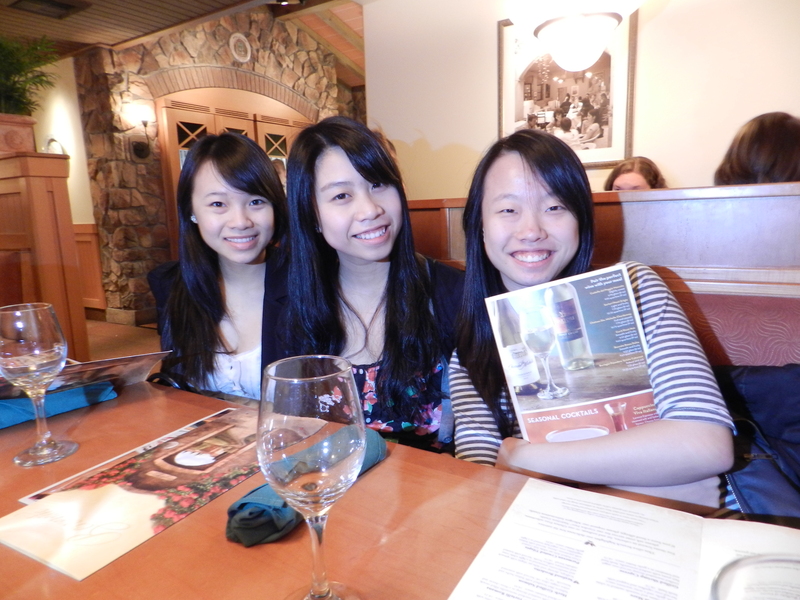 We ate at Olive Garden! It was my first time in that American chain, but I am amazed by all the bottomless dishes! They refilled practically everything! Monica, Josh and I were still pretty full from lunch so we decided to each get an appetizer and share. 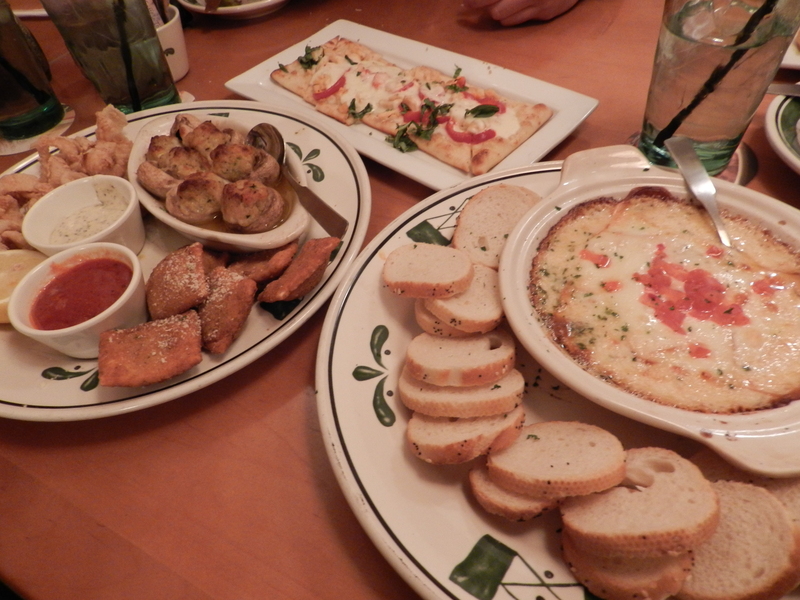 I got a Smoked Mozzarella Fonduta, Monica got a Italian Sampler, and Josh got a flatbread, though I forgot which one. 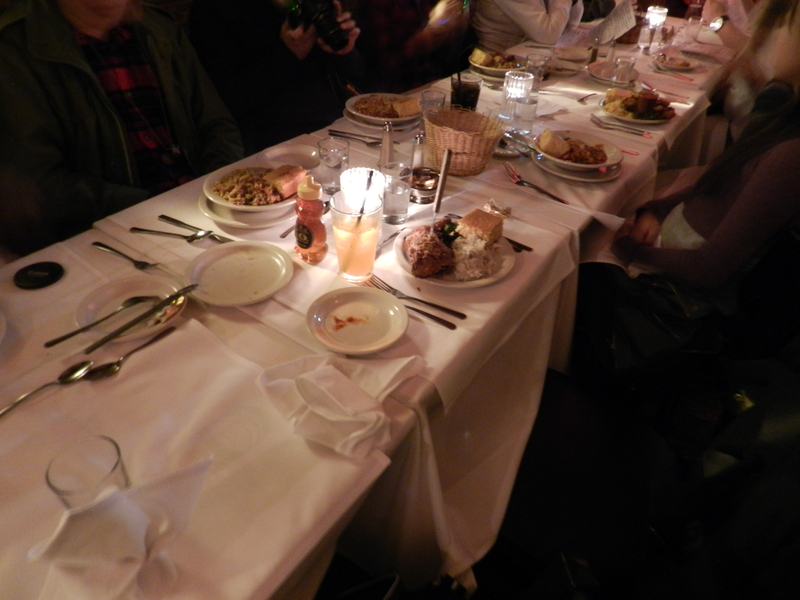 We ended up not even finishing our three appetizers because it was so filling and big! Afterwards, we spent a good portion of time fooling around in the parking lot and rearranging our shopping bags and luggage. 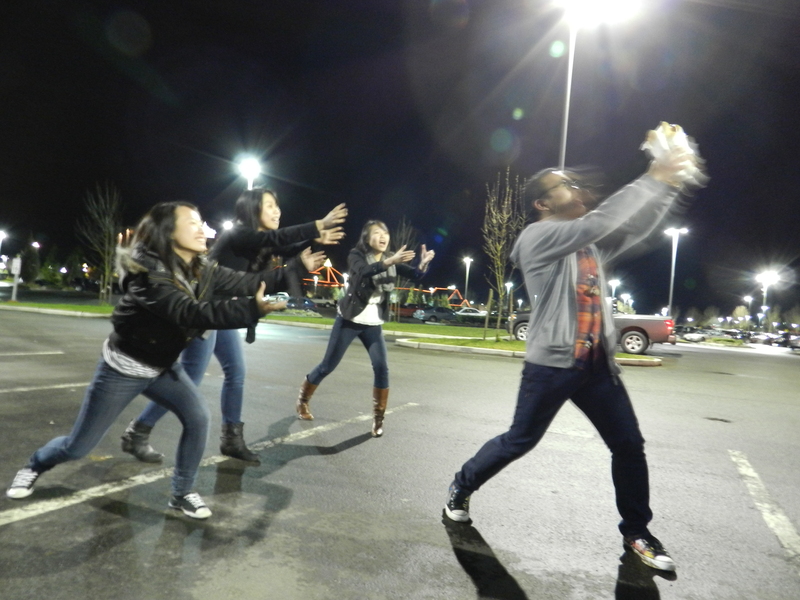 At some point, we accidentally set off a car alarm when we were messing around with breadsticks. Do not ask. I’ve never been to Portland before but that sounds incredible fun! I’m not even on my Reading Break yet and most of my friends aren’t too 😦 I would love a mini road trip right about now with a good shopping spree! If you want to go shopping on a road trip, DEFINITELY GO PORTLAND! NO TAX! =) And they have outlets too! You’re not on your reading break yet?! I totally thought everyone had theirs and UBC was late! lol! WOW! William will die XD BUT I would so want to!!!! And going somewhere makes the break seem extra long!